We are thrilled to have been able to help Cancer Research UK thanks to our friends at Gone For Good. Magic Van’s involvement has helped boost the capacity on CRUK’s busy delivery routes. Starting from our base in Fulham, we dropped off donations to local stores as well as picking up new donations to deliver back to base in Stevenage. Upon arrival, the donations are sorted and redistributed to shops in the area as quickly as possible. We set aside one day a week for four weeks to lend a helping hand to the charity, and we are looking forward to working with Cancer Research again in the near future! “With over 590 shops across the country, supplying them all with the generous donations of our supporters is no easy feat. 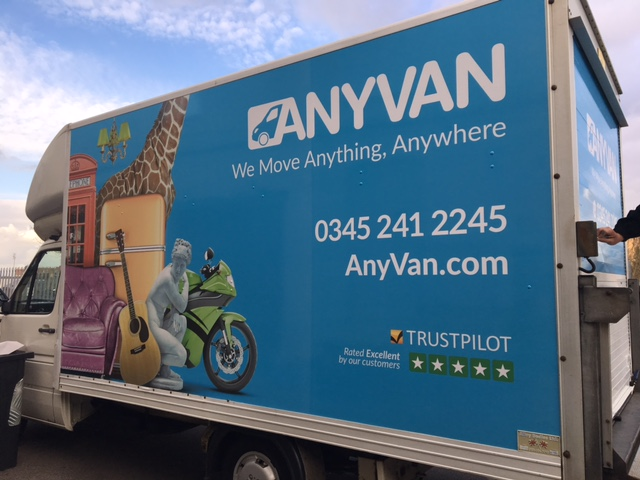 We were delighted to receive the support from AnyVan’s Magic Van to help our London depot in supplying a range of our shops with much-needed stock. The Magic Van helped not only to drop off donations to our shops but also collected donated items ready to be sorted and distributed out to other shops in the area, helping to ensure we always get the best value from each individual donated item. “The feedback from our shops on the normal Monday route was very positive – all the shops said the drivers were very pleasant and efficient. The culled stock was collected earlier than usual which gave those shops more space to process new donations more quickly. [Our] Hounslow shop was particularly pleased as the fact that the van was double-manned meant the stock arrived in Hounslow a good 2 hours earlier than normal, this shop has average £130 per hour sale. So each week they had the potential to generate an extra £260 thanks to the early delivery. Hi found your write up very helpful , dew to a move ( no date as yet), will be looking for help with move, as I’m recovering from Lymphoma ( cancer of the blood) support cancer Research in many ways , will be needing white bedroom furniture, prices in my range. Hi , found your write up very helpful to me , as I will be moveing soon( no date as yet) and will need help, I am recovering from Lymphoma ( cancer of the blood) will be needing white bedroom furniture, fund good price on this advert, could you reply how would l go about arranging this, will be peace of mind to J Mclean.